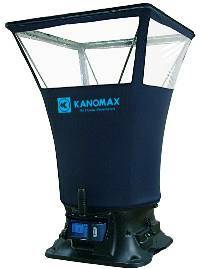 The new Kanomax TABmasterTM air capture hood is the perfect tool for measuring HVAC supply and return airflow. Interchangeable hoods in five differetn sizes make it a snap to sample the air for any duct size. The unit is lightweight and easy to handle. The full color screen can be tilted so it’s always at the optimal viewing angle regardless of height. The TABmaster simulateously meaures and reports air flow CFM), temperature and humidity. The on-board memory stores up to 3000 readings and the advanced data storage features enables you to store multiple readings under a single ID number. The 6710 TABmaster ships complete with a standard hood (2 ft x 2 ft), carrying case, AA batteries, PC communication cable, data processing software, user manual, and NIST Certificate of Calibration. 12 x 48", 24 x 48", 24 x 36", 36 x 36"